Sporteventi provides the perfect mix of coaches, instructors and guardians for all the participants of the AC Milan Camp. We try to ensure that all the kids are happy and satisfied with the camp programme and parents can be reassured that the safety of camp participants is our top priority. 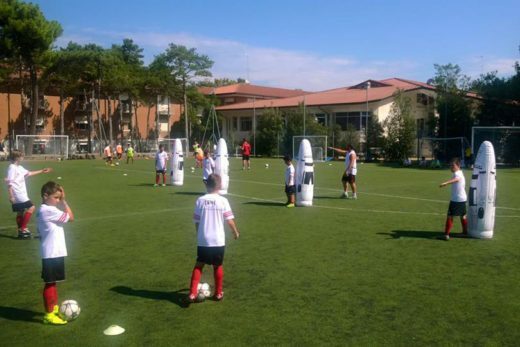 We at Sporteventi are fully aware of the enormous responsibility that we have in looking after the participants of the AC Milan Camp and we are entirely focused on the success of this objective. Below we will give a brief outline of the actions we take to ensure maximum safety before and during the activities of the AC Milan Camp. The staff consists of AC Milan Trainers who have made their mark on the footballing history of AC Milan. 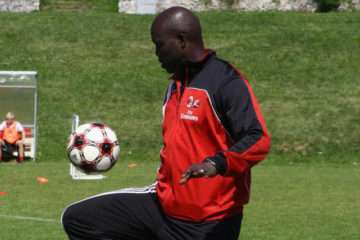 They have been or are part of the coaching staff of the red and black club’s youth sector. Their role is setting up and supervising the training sessions and the camp programme. The operations staff is directed and chosen by Luca Santochirico. 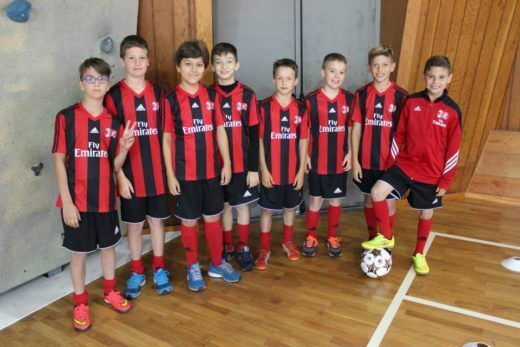 All Sporteventi coaches come from the AC Milan Football Schools or from other very prestigious football schools and are selected based on their teaching and technical expertise. 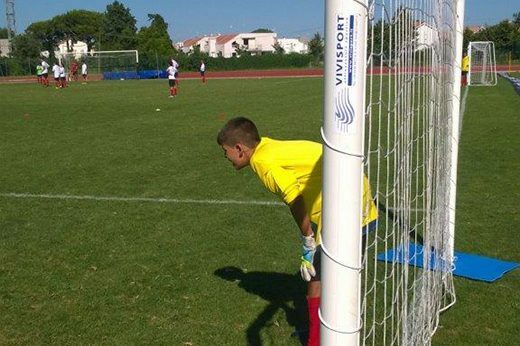 For us at Sporteventi a coach is first and foremost an instructor who must know how to communicate with kids of all ages and nationalities and must be able to empathise with them. We pay special attention to the coach’s language abilities. 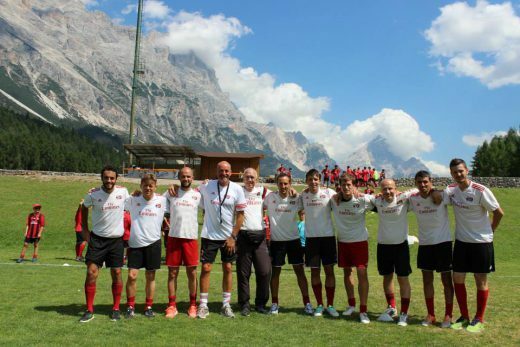 The complete staff (AC Milan Training Director, Sporteventi Manager, Assistants, Goalkeeping Coaches, Coaches) allows for 1 staff member to every 8 participants (ratio 1:8). The Sporteventi Manager and the female assistant are available to parents day and night. 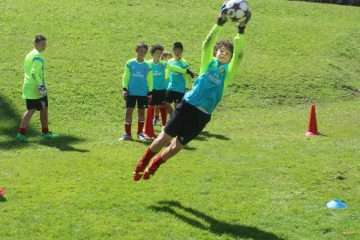 Their mobile phone numbers are provided to parents in the AC Milan Camp programme and on the first day of camp. The Sporteventi Chairman’s mobile number is also provided. Sporteventi staff are supervised by the AC Milan Training Director who is in constant contact with the Sporteventi Chairman and with AC Milan. Sporteventi administrative staff supervise the camp directly at least 3-4 times a week. The official languages of the camp are Italian and English. Half of the staff speak English fluently and one coach also speaks fluently Russian. 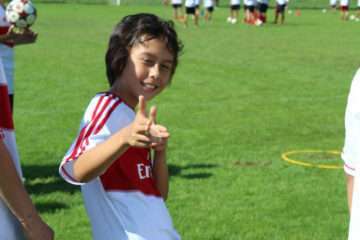 The Sporteventi Milan Camp every year hosts kids from 50 different countries and in 2016 was reviewed by the NY Times. In accordance with the programme for the typical day for the site, wake-up time is between 7.45 and 8.00. Each participant in the AC Milan Camp can set their own alarm clock, request an alarm call via the hotel intercom or be woken up by the coaches responsible (1 or 2 on each floor of the hotel). After waking up the AC Milan Camp participants have 30 minutes to come down to the breakfast room and have their breakfast. In accordance with the programme for the typical day the participants in the AC Milan Camp on the DAY formula will arrive at the meeting place established (hall, reception or directly to the playing field). A coach specially responsible for the participants will greet and take charge of them. The staff will constantly remind the kids during the day about the daily programme so that the participants in the AC Milan Camp are always aware of the times of activities that take place from the morning onwards. 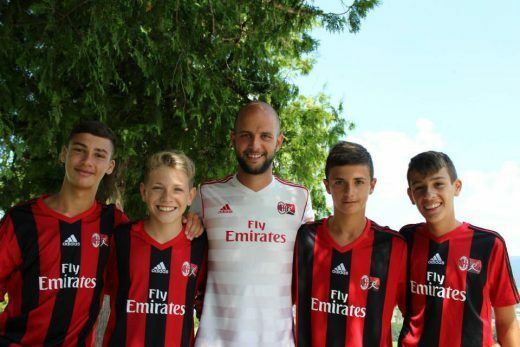 In places where the transfer to the playing fields takes place by bus, a division into training groups is made (younger/middle/older) and once that is done the correct number of kids board a private bus available to participants in the AC Milan Camp. Kids are checked constantly, whether they are going to the playing fields, on an excursion or just going for a walk. 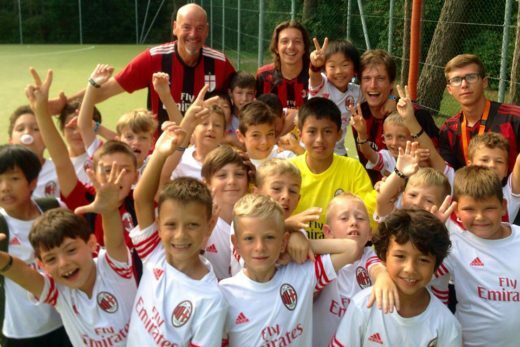 The coaches responsible for the younger kids at the AC Milan Camp help and assist them constantly. A coach will be present after training and matches who will help in the collection of technical and sporting gear. In each location, depending on the layout of the hotel, at times when the AC Milan Camp participants visit rooms or take advantage of the hotel’s open spaces, the staff are organised so as to have at least one coach in the hall, on each floor and in the recreation/games room. The coach will supervises the conduct of the kids, so that it is always respectful of the hotel, and will prevent them wandering off independently. The participants in the AC Milan Camp are watched over, day and night. During the day no participant is ever allowed to wander off without the presence of a Sporteventi staff member, even if it is going out of the hotel for a few minutes or even if the camp participant is a seventeen-year-old (who is still a minor and therefore under the protection of Sporteventi). At night each floor of the hotel facilities used is supervised, staff members spending the night on the various floors. The hotel itself will assist our staff, those on duty in reception advising our staff if camp participants behave improperly or act independently. The Head of Site (Sporteventi Manager) will always remind all staff members of the checks to be carried out and the timing of daily activities. This occurs at least three times a day – early in the morning before breakfast for the kids, just after lunch and in the evening, after they have gone to bed. Each AC Milan Camp location run by Sporteventi is chosen based on the opportunity to receive prompt medical care. So the sites at Cortina d’Ampezzo, the Asiago Mountain Plateau and Jesolo Lido are equipped with a public medical-hospital facility able to provide first aid promptly if necessary. The Bella Italia Sports Centre has an extension which can accommodate up to 3,000 people and has its own private medical suite. All staff, particularly the female assistants, look after participants who have specific dietary requirements related to specific illnesses (coeliac disease), to severe allergies, to religion (Muslims, Hindus) or to family customs, liaising with the chef and the kitchen staff of the restaurant. Our staff also support participants in case they need to follow a particular drug treatment during the AC Milan Camp or in case they must always carry with them lifesaving drugs. Staff check weather conditions at least three (3) times daily – in the morning, early afternoon and evening for the next day. 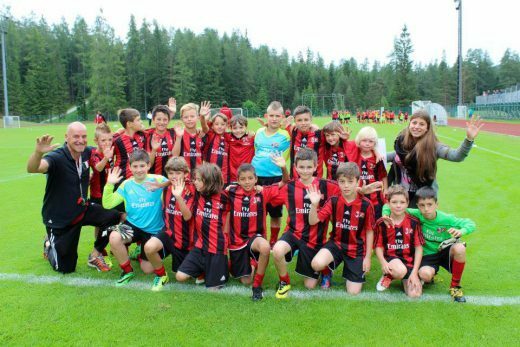 In mountain locations, in case of heavy rain, the training of younger participants (6-9 years old) at the AC Milan Camp will take place in the gym. In seaside locations, in case of excessive heat, morning training will take place 30 minutes early and afternoon training will be delayed 30-60 minutes or shortened. These events are infrequent but in any case staff will protect the health of the kids. If a participant is particularly tired, the staff will authorise him/her to stay in the hotel to rest, properly supervised. During training sessions, Sporteventi uses its own technical gear exclusively (from goals to cones), entirely provided by Vivisport srl (renowned for providing the goals on most of the SERIE A pitches in the Italian football championship and for providing the goals for the UEFA Champions League Final at the San Siro Stadium 2016). The technical gear involved is of the highest quality and in some cases is designed and manufactured by Vivisport exclusively for Sporteventi and is certified for solidity, quality and safety. All trips within the AC Milan Camp are made on minibuses or private buses. The driver(s) will be on our staff and always available to the camp participants. It is our policy that AC Milan Camp participants never travel on foot but always by bus, even if the football pitch is just a few hundred metres from the hotel. Kids who need a transfer from the airport or train station to the camp location and, after the AC Milan Camp finishes, from the camp to the airport or train station, can count on a great service provided by a specialist company in partnership with Sporteventi for over 15 years. The drivers are known personally by Sporteventi administrative staff and are in contact with them before, during and after the transfer. The drivers themselves, on explicit request, can perform an unaccompanied minor procedure at the airport and in any case never leave a camp participant alone in case of difficulties. Personal accident insurance is valid only for participants resident in Italy. For participants resident outside Italy we recommend an insurance policy for hospitalisation and treatment in case of accident. The insurance policies are taken out from the company Allianz Spa. In emergencies related to accidents, homesickness, illness or indiscipline of the participant, the staff will intervene immediately giving first aid or taking the participant to hospital and contacting the parents as soon as possible to discuss the situation and agree on the next steps.